As a researcher who looks a different industry or market every week, I’ve often tapped into LinkedIn’s advanced search options to find an expert or, better yet, a librarian who can point me in the right direction. (Pro tip: You can identify librarians by including “Libraries” as an industry filter.) And I’ve mined job listings to glean insight into the strategic direction of an organization. Given the relatively professional level of conversation in LinkedIn posts, a search facet I have recently been using more often is Content search, which just searches posts. 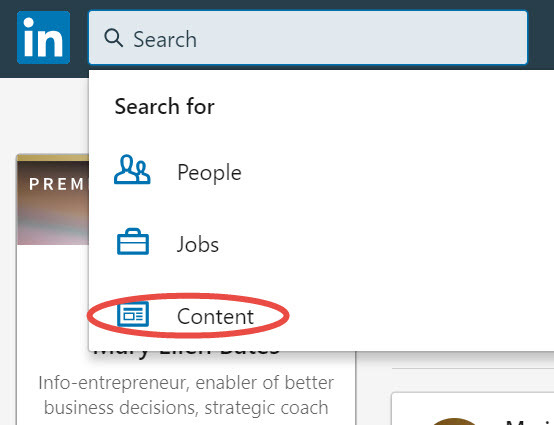 To get to Content search, just click the Search box in the upper left, and a drop-down menu will appear with search options, including Content. As usual, I came home from the 2018 annual conference of the Association of Independent Information Professionals suffering from insight overload. One of the Snap Talks that caught my attention was “From CI to CSI: Using Social Media Apps to Gather Intel and Enhance Your Research” by Eddie Ajaeb of Nighthawk Strategies. He reminded us that the visibility of Facebook comments, likes and tags are determined by the post they’re tied to, not by the person commenting, liking or tagging a post. Even if your privacy settings restrict who can see your posts, if you engage in someone else’s post, that post’s privacy settings determine how viewable your interaction is. If you comment on a post that everyone can see, then everyone can also view your comment. Pay attention to the little icon just below the original poster’s name. If there’s a globe icon (see below), your comments will be shared with everyone. If there is a gear icon or an icon of several heads, the visibility of the post is restricted. You can mouse over the icon (see below) to confirm how private your comments will be. Using Social Media For “Real” Research?!? In preparing for one of my presentations at Web Search University, I was asked whether social media could actually be used for “real” research… that is, to support strategic decisions and better outcomes. 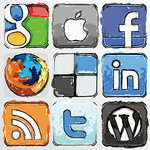 And what about the concerns of some researchers about privacy in social media?